Virtually all real estate professionals believe that a property’s curb appeal is a crucial ingredient to wooing potential buyers, and the right outdoor renovation projects can pay sellers back, not to mention making them much happier homeowners. According to the National Association of Realtors’ 2016 Remodeling Impact Report, which polled homeowners who recently complete an improvement project as well as landscaping professionals, 99 percent of real estate professionals believe that curb appeal is important to buyers. Almost as many, 96 percent, have recommended that clients take steps to improve their home’s curb appeal. The report underscores the importance of landscaping, with a standard lawn-care program ranking as the outdoor upgrade that most appeals to buyers. Three-quarters of real estate professionals have suggested that sellers invest in a lawn-care program, defined here as six applications of fertilizer and weed control on a 5,000-square-foot lot. Professional lawn care costs an average of $330 and is projected to net the homeowner three times the cost at the time of sale. 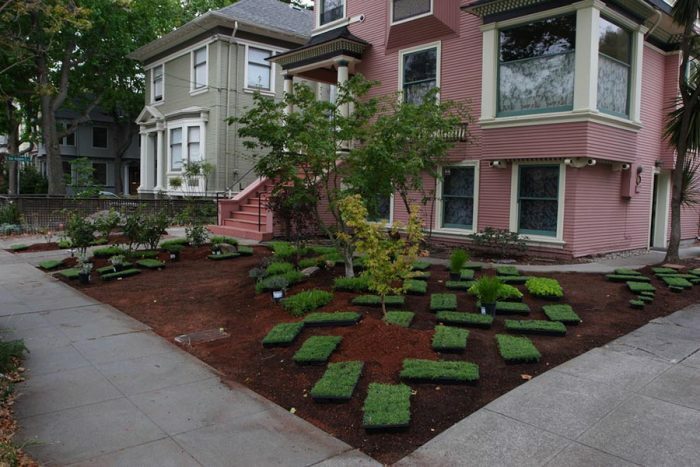 An overall landscape upgrade is the outdoor improvement that’s second most likely to attract buyers and consists of installing a walkway, adding planters, and planting flowering shrubs and a deciduous tree. Overall landscaping jobs do not offer as big of returns as professional lawn care, with the average job costing $4,750 and paying back $5,000 when the home sells. New patios are also higher on buyers’ wish lists, although only 4 percent of real estate professionals report having recommended this pricey upgrade. Overhauling this outdoor space costs an average of $6,400 and is estimated to bring in $6,525 when the home sells. Seed lawn is not a particularly glamorous outdoor improvement, nor do buyers rank it particularly high, but it is inexpensive and offers the largest return on investment of any project included in the study. Costing $120 per 1,000 square feet, seeding a lawn nets more than four times the cost at the time of sale. The aforementioned upgrades, along with others, can bring homeowners a great deal of happiness according to NAR’s Joy Score, which ranks projects on a scale of 1 to 10 based on level of owner satisfaction. A full landscape upgrade notches a Joy Score of 9.8, with 75 percent of owners reporting a greater urge to stay home since the job’s completion. A new patio earns a 9.6 rating, and 82 percent of owners say that they want to hang out at home more often. The improvement that makes homeowners the happiest is also the most expensive and offers the lowest return on investment. At an estimated cost of $50,000, a swimming pool is estimated to add only $25,000 at the time of sale, but it earns a perfect 10 on the Joy Score. Owners who install a pool likely save plenty of money on entertainment in the long run, since 95 percent of them report staying at home in order to enjoy it.